Ald. Judy Fiske (1st) attends a council meeting. 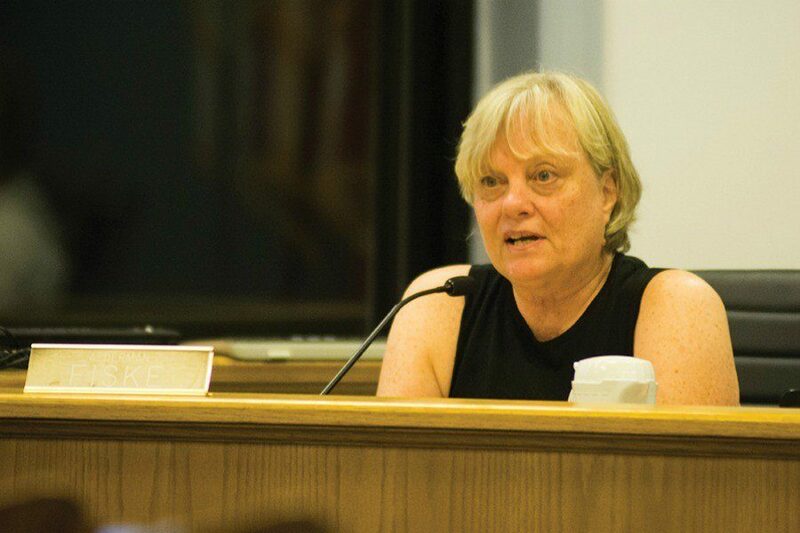 Fiske was one of two aldermen who voted against the energy benchmarking ordinance, which passed at Monday's meeting. Aldermen voted Monday to approve an energy benchmarking ordinance, requiring owners of large buildings to track and report their energy usage. The ordinance, which was sent through with a 7-2 vote, will require owners of buildings measuring at over 20,000 square feet to participate in the benchmarking. More than 550 buildings in the city will be affected, according to council documents. Under the ordinance, affected buildings will have to report their energy usage using a benchmarking tool developed by the Environmental Protection Agency. All condominium buildings between 20,000 square feet and 49,999 square feet will be excluded from the ordinance. The ordinance was not received well among many property owners in the city while it was going through council proceedings in the summer and fall. After receiving criticism in September when the ordinance was introduced to council, aldermen voted to hold the ordinance until Monday’s meeting to give city staff more time to communicate with property owners. Several aldermen also expressed concerns at Monday’s meeting that the ordinance was unfair to building owners who may have a difficult time collecting the data. Ald. Judy Fiske (1st), who voted against the ordinance, said the ordinance would place a burden on many property owners in Evanston. “We’re making things really tough for some people in our community who have so much to contend with in terms of managing their buildings,” she said. Building owners will be required under the ordinance to ask their tenants for any energy data they cannot collect themselves. If tenants do not provide the data, building owners will not be penalized as long as they benchmark the building otherwise and can prove they requested information from their tenants. Building owners who don’t report their energy usage data may be subject to a $100 fine for each offense. Ald. Donald Wilson (4th) said at Monday’s meeting that he would vote for the ordinance but would be “watching it closely” to see how it would work. Ald. Eleanor Revelle (7th), who voted for the ordinance, said the ordinance was necessary for building owners to take a closer look at their energy use. “Sometimes you really do need not the carrot but the stick,” Revelle said. Council also voted to approve a welcoming city ordinance that prohibits city officials or employees — including police officers — from questioning someone about their citizenship status unless required by state law or a court. It also protects undocumented immigrants from being held for immigration authorities by EPD, unless they have been convicted of a serious crime or have a warrant out for their arrest. Editor’s Note: A previous story incorrectly reported that City Council had approved the welcoming city ordinance at their Nov. 28 meeting. The ordinance was introduced at that meeting and approved at the Dec. 12 meeting.